On Wednesday, the International Collegiate Tennis Association released their updated rankings for singles and doubles play and among the top 20 in doubles was North Texas’ duo of seniors Maria Kononova and Tamuna Kutubidze. The pair ranked No. 19 among doubles players in the nation, 32 spots higher than any other doubles players in Conference USA. Individually, Kutubidze was ranked as No. 69 in the nation. Kononova and Kutubidze went 24-4 together two years ago, a record that stands in North Texas program history. Recently, the two seniors have not played together in the doubles. Kononova has been paired with fellow senior Mingying Liang and Kutbidze has alternated underclassmen partners between sophomore Nidhi Surapaneni and junior Haruka Sasaki, but Lama confirmed that the team is “bringing the guns out” and returning to the familiar combination this weekend. Lama said experimenting with different lineups helped them in the end. The Mean Green’s next match is on Friday at 2 p.m. against Sam Houston State. They will also play on Saturday at noon in a match that was recently moved to Lifetime Fitness in Plano due to weather concerns. 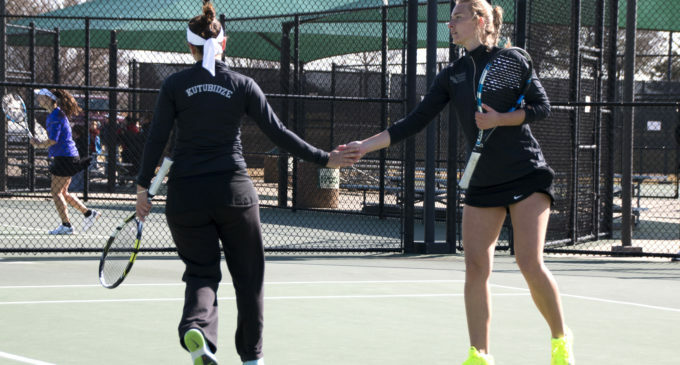 Featured Image: Tamuna Kutubidze (left) and Maria Kononova (right) congratulate each other after a point in their doubles match against Central Arkansas in their freshman year. File.